Take if U will, a picture... Seriously or just for kicks... Your eye peering through the viewfinder... Rising excitement... As the shutter clicks; Shoot if U can a courtyard... With subjects in brightness and gloom... Make your friends strike curious poses... One shutter speed... One aperture and no zoom. This purple box made of plastic... Delivers a look that's so bold... Digital just cannot touch it... Its pictures are sure something 2 behold... This camera we call the Holga... We think it's simply divine... When U look over your photos... U will party like it's... 1999! Holgawood - A collection of ten Holga 120N cameras based on the Holgawood theme. Each camera is available in a unique color and includes a cool collectable story card to go alongwith its individual personality. Collect all 10 and save. See item #189120. The Holga camera was initially introduced to the Chinese public in 1982 as an inexpensive camera for everyday use. Shortly after its introduction, it became an underground artistic phenomena. Using the Holga is an exercise in breaking free from dependence on technology, precision and controllability. The slight softness of the images, vignetting and random light leaks produce dream-like, one-of-a kind images. 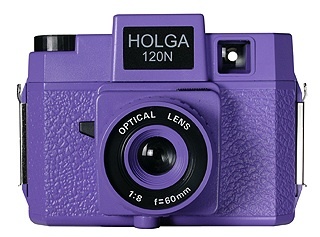 The Holga 120N is modeled after the original Holga released in 1982. For most of Holga's history, the Holga 120N family was only available in black. The Holgawood Collection is a line of colored Holga 120N cameras inspired by "Tinsel Town". All Holgas purchased at Freestyle include our famous Holga Manual with tips on using, maintaining and customizing your Holga.